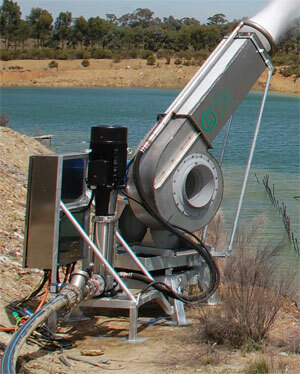 Wet Earth Evaporators are based on Ecology's industry leading Fog Cannon technology. Using their knowledge in creating mist and throwing it over large areas, Ecology have designed units designed specifically for evaporation. Wet Earth Evaporators have been designed to minimising the water droplet size by using a large number of specialised small droplet nozzles and high water pressure pressure (15 bar). We maximise the spray coverage area through using a fan with a high discharge velocity and the Evaporators continually rotate through either 90 or 180 degrees. As air temperature, humidity and wind speed are a significant factors in evaporation rates, the evaporation rates that are achieved will vary from site to site and day to day. Most locations in Australia should achieve evaporation rates from 40% to 90%. Wet Earth Evaporators requires an external power supply in addition to the water. While the Evaporators have a booster pump to get the pressure to 15bar, they require flooded suction (ie pressure > 0 bar). If the water supply is from a dam then a submersible pump option can be supplied with the unit and integrated into the control panel. The Evaporators by default have the capability for external automatic control. This can be a simple timer, or integration with a external systems. We can also provide fully customisable weather station based modules which can control any number of Evaporators. The Evaporators have a solid galvanised steel base and the control panel, pump, fan and all parts coming into contact with water are stainless steel. 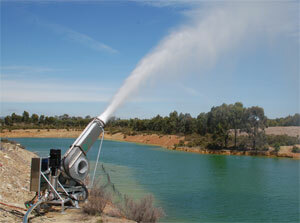 Wet Earth Evaporators are available for purchase or long term hire. If you have a water disposal issue you would like to discuss or would like more information then please call us on +61 2 6062 3300 or send an email to sales@wetearth.com.au.